Well, that will be then, and now let’s start from the beginning. I collected 12 indications that the personality portrayed as the Teacher and spiritual educator in the history of various nations in different parts of the world wore a beard. There are some records that he was not alone (logically, he had assistants). On banners below I showed no chronology, but just geography so far. Hopefully, this information will be sufficient to gain an idea of the work performed by the bearded educators. Perhaps, let’s start from Osiris – for some reason he is dearer to me. Osiris (Egyptian Wsjr, Usir; ancient Greek Ὄσιρις, Latin Osiris, other spellings – Ausir, Asiri or Ausar): the god of regeneration, the king of the afterlife in ancient Egyptian myths, and the judge of the souls of deceased. Ruling in Egypt, Osiris taught people agriculture, gardening and wine-making… Though peculiar, his beard is clearly seen in his images. Read more on Wikipedia. 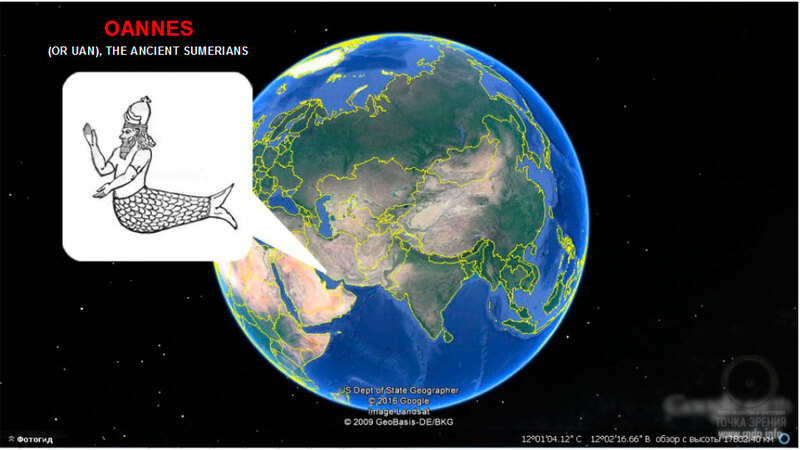 Oannes (or Uan): according to the Sumerians, a hero with a fish head and body, but with human legs (and a human face) who came out of the Persian Gulf. The legend of Oannes is known from stories of the famous Babylonian historian Berossus. Oannes came to Mesopotamia as a reformer and educator. He brought civilization, script, science, and law to local dwellers. Oannes wrote and gave to people a story about the creation of the world and the state structure. 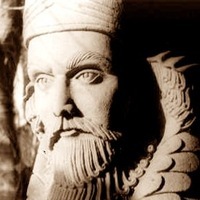 Ahura Mazda (also Ohrmazd, Ahuramazda, Hourmazd, Hormazd, Harzoo and Hurmuz, Avestan ahura- mazdā-, ancient Persian ahuramazdā), Ormizd or Ormazd: “the Lord of Wisdom”: the Avestan deity enunciated by Prophet Zoroaster, the founder of Zoroastrianism / Mazdaism, as the single God. 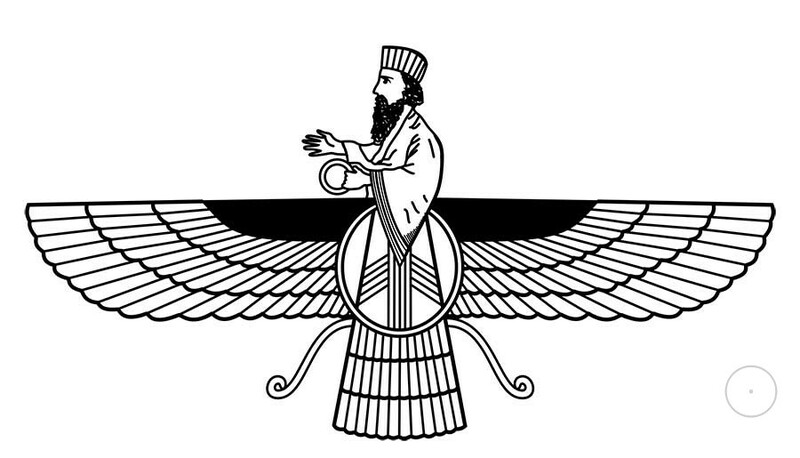 In Avesta Ahura Mazda is the Creator residing in eternal light, the creator of all things and the giver of everything good, the omniscient organizer and sovereign of the world, and the highest object of worship for Zoroastrians who call themselves mazdayasna – “the worshippers of Mazda”. Ahura Mazda is the father of Asha (righteousness and truth) – the law by which the world develops, the protector of pious people, and the leader of all good forces that fight falsehood – evil and destruction taking place in the world against his will. During the ultimate transformation of genesis (Frashkard) he and all good creatures will carry out final purification of the world. 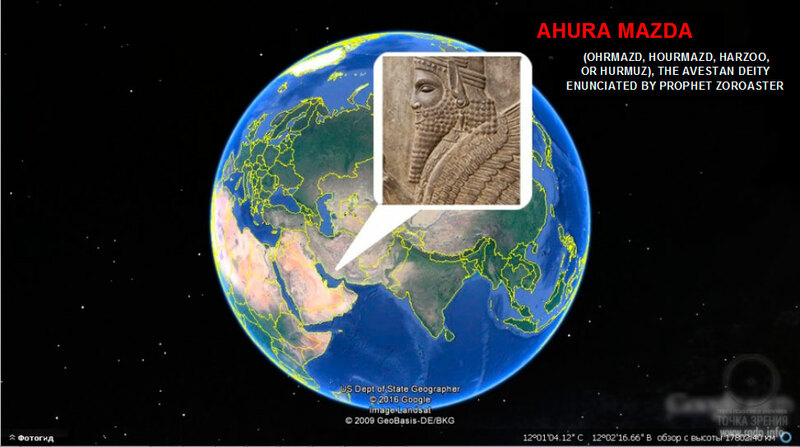 We already touched upon the topic of resemblance between Ahura Mazda and Rigden Djappo – see the article Ahura Mazda – the Holy Spirit – Rigden Djappo! Although Ahura Mazda is great, he is in very close relations with people. Anyone who’s on his side can feel oneself close to him as his friend, brother or father (Y 45.11). He is gracious to everyone who seeks his friendship (Y 44.17). One who supports the law of Asha in the world becomes the most welcome ally of Ahura Mazda, and God endows such person with Integrity and Immortality. Ahura Mazda sees everything. It’s impossible to deceive him (Y 45.4) or hide anything from him (Y 31.13). He is the supreme sovereign of the universe, and the future depends on him (Y 29.4). He will determine who will win the battle between the pious and the mendacious (Y 44.15). When he appears in the world, evil (Druj) will be destroyed (Y 31.4) and Frashkard – renewal of the world – will take place. Ahura Mazda originally determined two types of behaviour – compliant with the world order or contrary to it (Y 46.6). People choose between these two ways according to their free will, but the end for those who choose different ways will be different (Y 48.4). An ultimate reward from Ahura Mazda is in store for both the pious and the mendacious (Y 43.4, 5) – salvation and all kinds of good for the former, and pain and destruction for the latter (Y 30.11, etc.). Read more on Wikipedia. Dagda, or Daghdha (ancient Irish name literally meaning the “good, kind God”): a deity in Irish myths, one of the main gods of the Tribe(s) of the Goddess Danu along with Lug and Nuada, the master of the kettle of plenty. The main source where Dagda’s biography and attributes are described is the saga Cath Muige Tuired. Being the character of many ancient Irish legends, Dagda embodied features that the Celts used to ascribe to omnipotent representatives of the kingdom of the dead, the divine rulers of the world. There are versions of Celtic legends where Dagda appears as a deity patronizing rich harvests and possessing infinite power over natural phenomena. Thus, according to legends, Dagda could control thunderstorms, lightening, hail, rains, and so on. 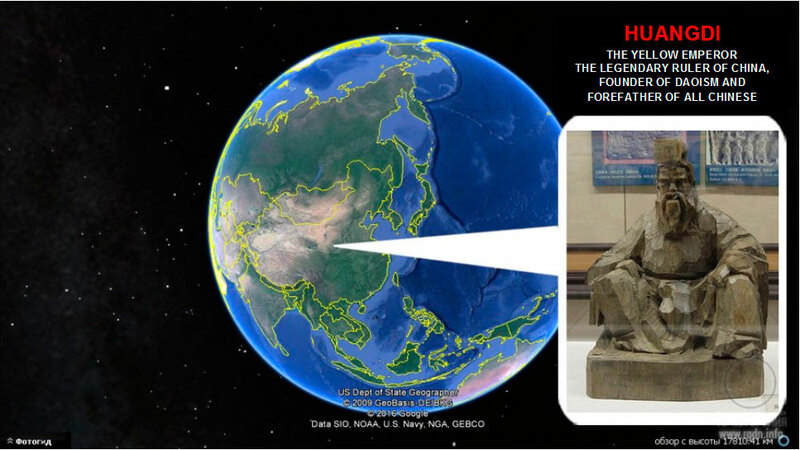 Huangdi, or the Yellow Emperor (Chinese 黃帝, ancient Chinese pronunciation **ɡʷaaŋ – k-leeɡs): the legendary ruler of China and the mythology character; also considered to be the founder of Daoism and the forefather of all Chinese. 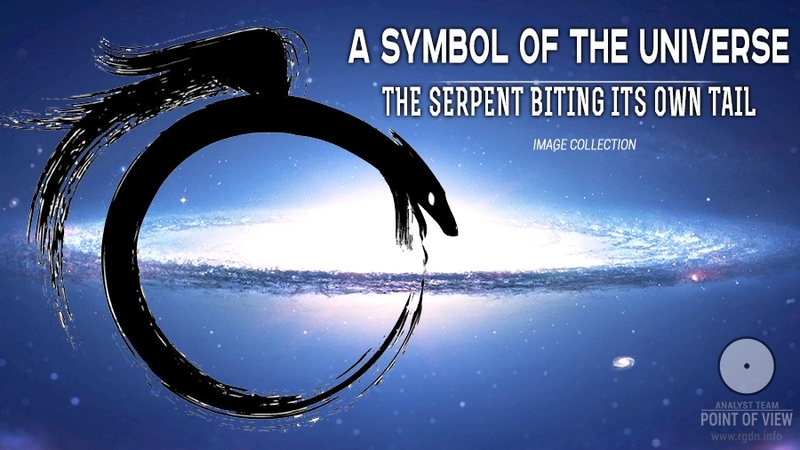 The name Huangdi is usually translated as the “Yellow Emperor”, but the hieroglyph 帝 (di) can mean not just “emperor”, but the “spirit” or “deity” as well. After a tough struggle Huangdi managed to subdue leaders of separate tribes and established the first Chinese state in Kunlun Mountains – far to the west of the Hwang He basin. Having maintained peace, Huangdi appointed officials and introduced the first national laws. It is believed that he invented an axe, a boat and an oar, a mortar and a pestle, a bow and an arrow, a dress and shoes, and divided land into plots. His associates invented a hieroglyphic script and a calendar. 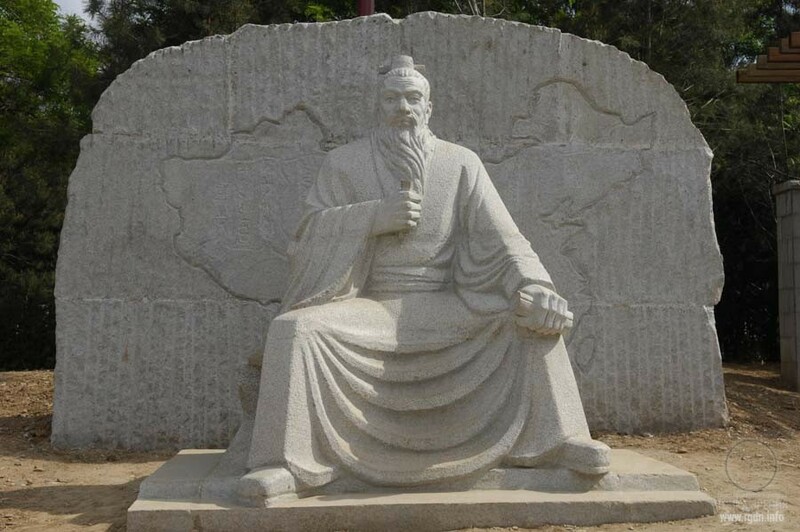 Moreover, Huangdi is considered to be the author of numerous classical writings, including fundamental medical treatise Huangdi Neijing and a brief versed text Yin Fujin revered in Daoism. On our website there’s a mention of him in the article Pyramids in China. Secrets of the Sons of Heaven. 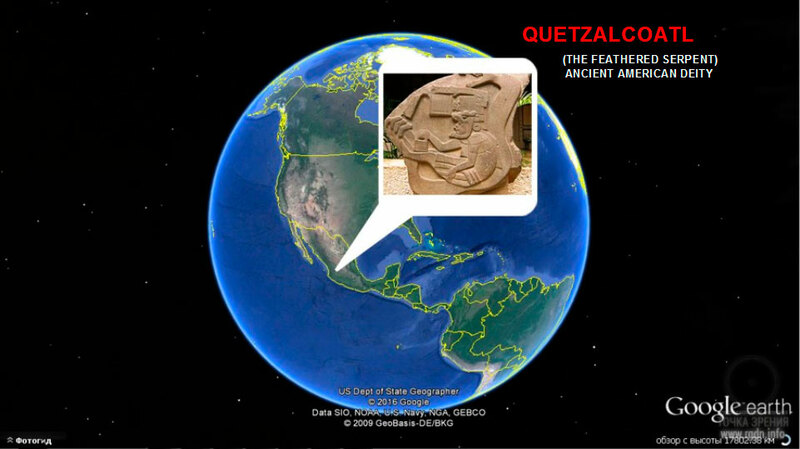 Quetzalcoatl (Aztec Quetzalcōātl – “the feathered serpent”; Spanish Quetzalcóatl; [ketsaɬˈko.aːtɬ]) is the name of an ancient American deity, one of the supreme gods of the Aztec pantheon and the pantheons of other Central American civilizations, and also the name of a historical figure. 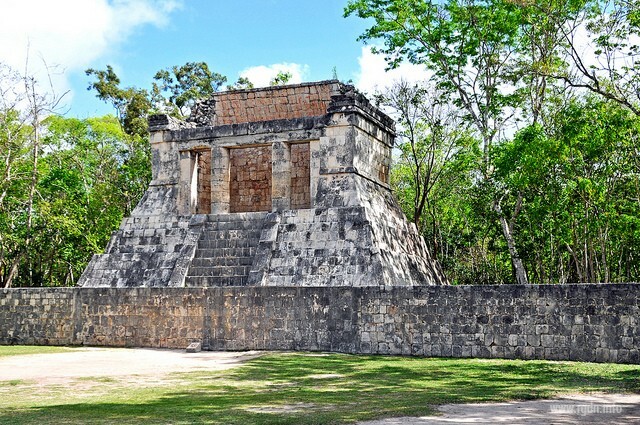 Legends say Quetzalcoatl ruled in Tula for over twenty years. 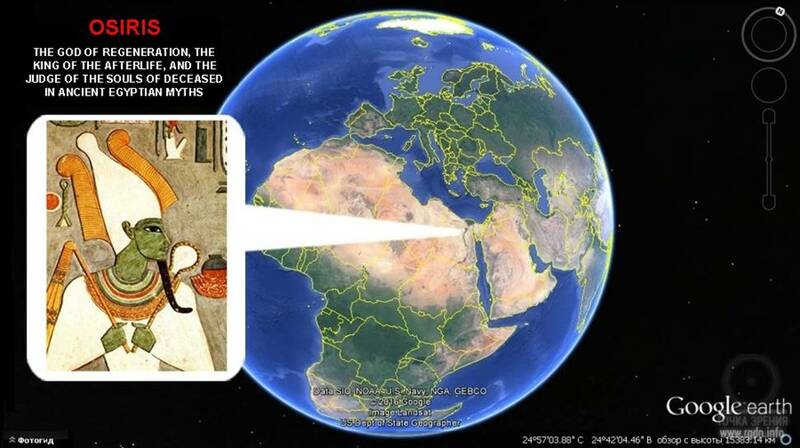 The great sovereign taught his people mathematics, medicine, astronomy, writing, jewellery making, weaving, etc. He is believed to have invented a chocolate drink, introduced a 52-year-cycle calendar and the canons of music and dance. The Temple of the Bearded Man! 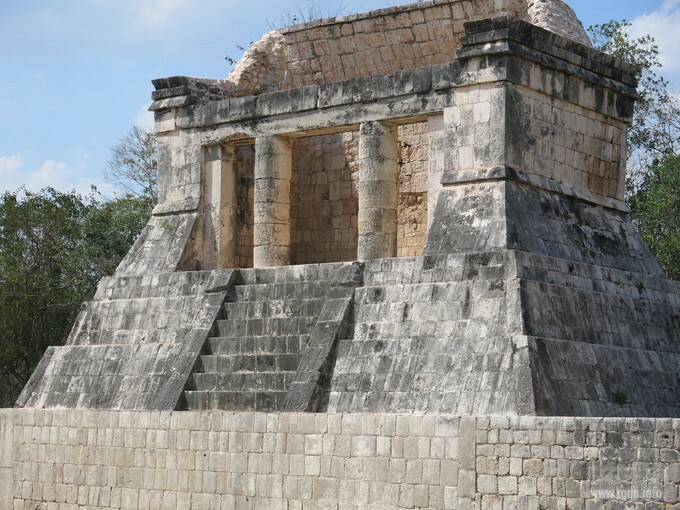 In Chichen Itza there is a rather interesting building – the Temple of the Bearded Man. It is situated in the northern part of the ball game ground. The temple name is due to the temple interior shape. It is often simply called the Northern. The acoustics is marvellous inside the building, making it possible to hear a person’s whisper in any point of the hall. Do you see? This indeed looks like beards, especially in the first photograph. Tiwanaku (Spanish: Tiahuanaco or Tiahuanacu): a pre-Columbian archaeological site in the Altiplano highland plateau, 20 km to the southeast of Lake Titicaca, La Pas, Bolivia. In 2000 Tiwanaku was included among the UNESCO World Heritage Sites, as “evidence of the power of the empire that played a major role in development of the pre-Columbian America civilization” (Vokrug Sveta / Around the World magazine). Tiwanaku was the centre of a civilization of the same name, which existed on Lake Titicaca shore in the 15-12th centuries BC. 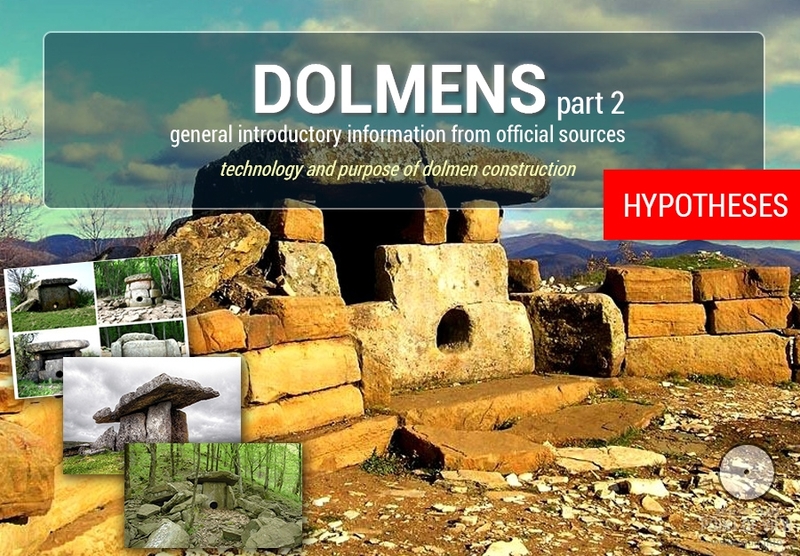 It is still a mystery how South American natives managed to build such stone structures on the highland plateau, for some blocks there weigh up to 200 tons. The decline of Tiwanaku culture that existed long before the Inca Empire in the current territory of Bolivia, Peru, Argentina, and Chile is also quite interesting. The city used to be called Taipicala – the Centre of the World, or Vinyamarca – the EternalCity (according to different sources), while now it is called Tiwanaku – the DeadCity. Doesn’t this seem familiar? 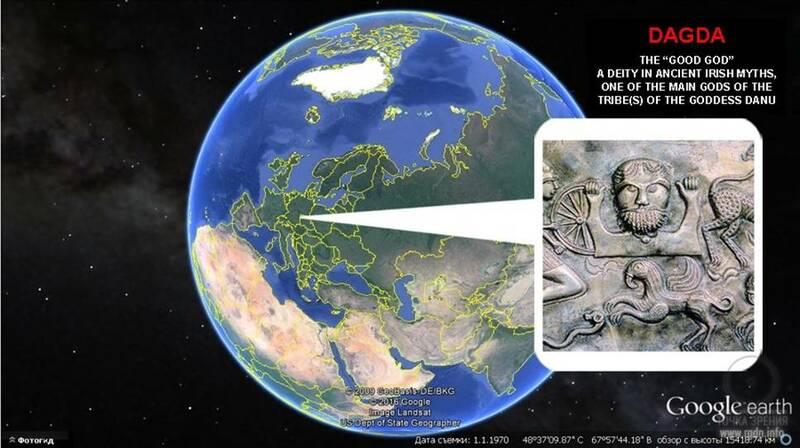 UNESCO is involved again, and the word dead is again applied. Viracocha (or Huiracocha in Spanish, Wiraqucha in Quechuan), Kon-Tiqsi-Wiraqucha (Quechuan): a deity regarded as the creator of the world in myths and religions of many pre-Columbian peoples of the Andean region. In Inca mythology Viracocha is the creator of civilization and one of the main deities. 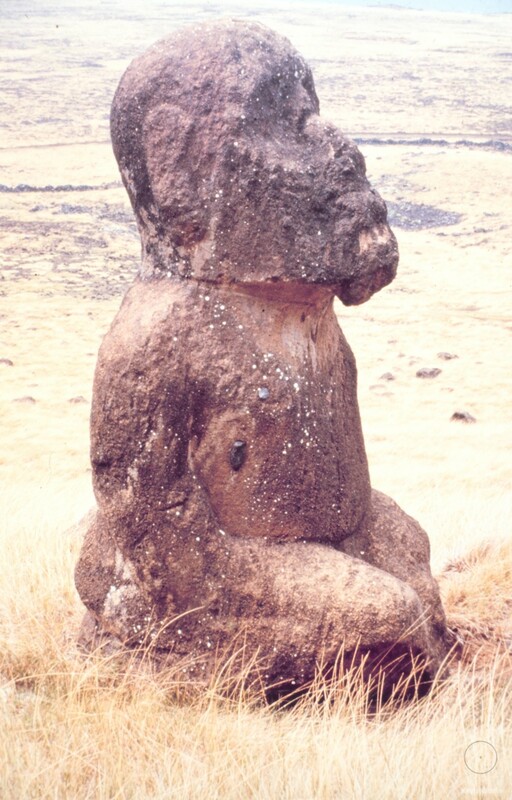 A bearded monolith (Monolito Barbado) with “companions” was discovered in Tiwanaku. 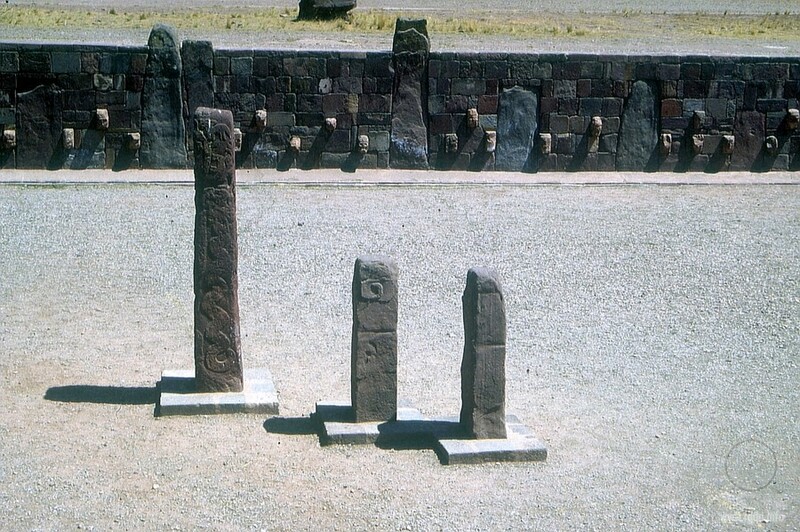 The monolith is considered to be the most ancient sculpture in Tiwanaku. It was given such a name because there’s something like a beard and a moustache around its mouth. It is also called KonTici Wiraqocha. He had a high forehead, and large, round eyes. His nose was straight, narrow at the bridge but flaring towards the nostrils. His lips were full. His distinguishing feature, however, was his stylish and imposing beard, which had the effect of making his face broader at the jaws than at the temples. Looking more closely, I could see that the sculptor had portrayed a man whose skin was shaved all around his lips with the result that his moustache began high on his cheeks, roughly parallel with the end of his nose. From there it curved extravagantly down beside the corners of his mouth, forming an exaggerated goatee at the chin, and then followed his jawline back to his ears. Above and below the ears, on the side of the head, were carved odd representations of animals. (Note by the article author: most probably, it’s an indication of the Lateral Aspects.) Or perhaps it would be better to describe these carvings as representations of odd animals, because they looked like big, clumsy, prehistoric mammals with fat tails and club feet. There were other points of interest. 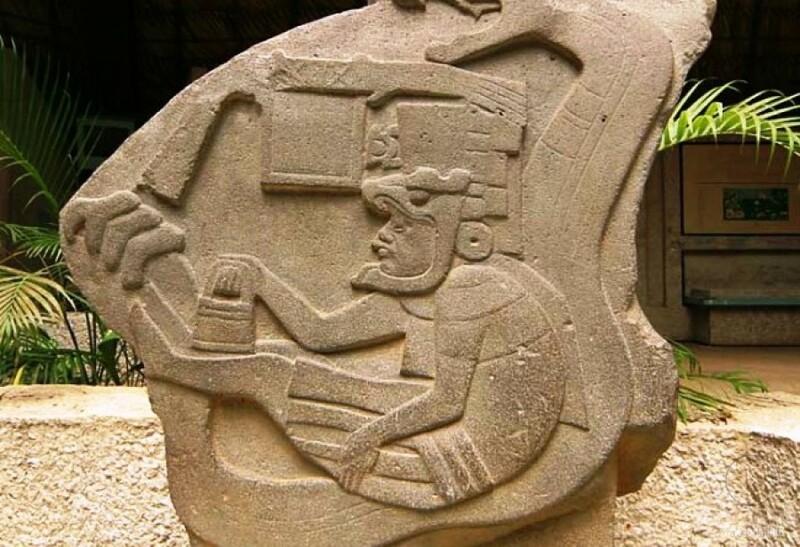 For example, the stone figure of Viracocha had been sculpted with the hands and arms folded, one below the other, over the front of a long, flowing robe. On each side of this robe appeared the sinuous form of a snake coiling upwards from ground to shoulder level. And as I looked at this beautiful design (the original of which had perhaps been embroidered on rich cloth) the picture that came into my mind was of Viracocha as a wizard or a sorcerer, a bearded, Merlin-like figure dressed in weird and wonderful clothes, calling down fire from heaven. An Incan deity. 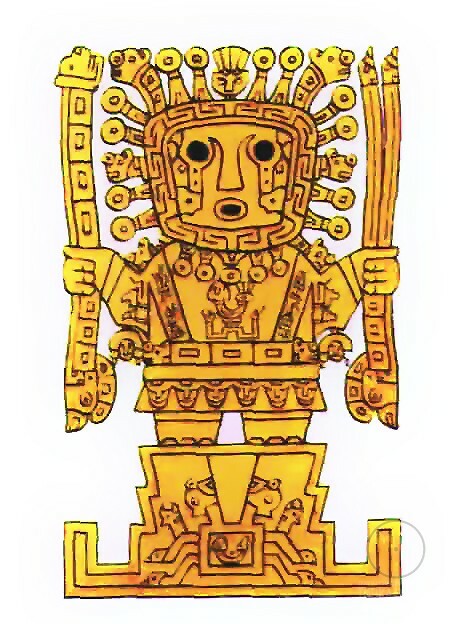 In Inca mythology, Kon was the god of rain and wind coming from the south, the son of Inti and Mama Quilla. Kon was also the brother of Pacha Kamaq who, as legend says, was driven away from the empire and sent to the north from where he had originated. However, he took the rain with him and left the Peruvian coast infertile forever. 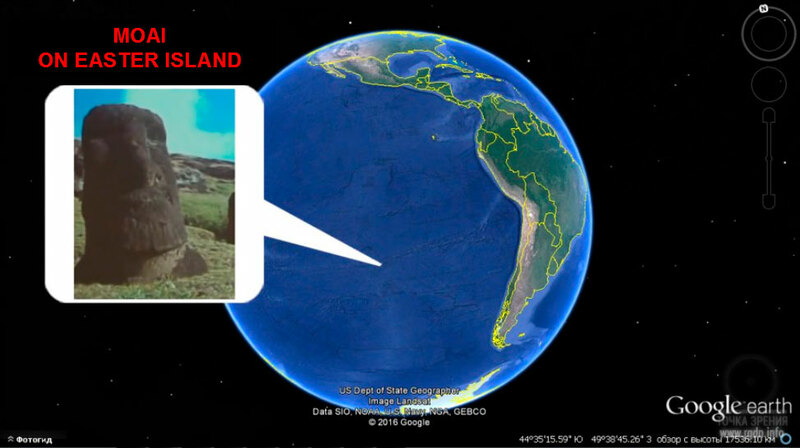 Originally, Kon was named Kon Tiqui (or Kon Tiki). In 1947, the anthropologist and marine biologist Thor Heyerdahl travelled from Peru to Polynesia on a raft called Kon-Tiki to demonstrate the possibility of contacts between the two cultures. 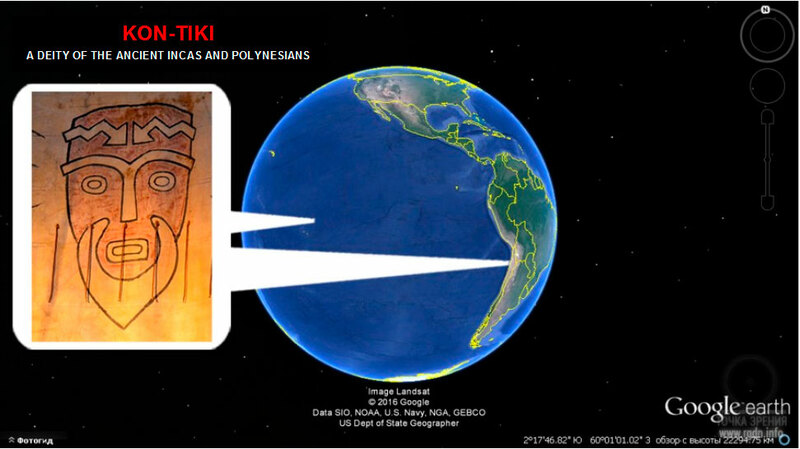 Consequently, the term meaning god (tiki) became common for Polynesians and Peruvians. Thus both my suspicions and my attention were turned more and more away from the Old World, where so many had searched and none had found, and over to the known and unknown Indian civilizations of America, which no one hitherto had taken into consideration. And on the nearest coast due east, where today the South American republic of Peru stretches from the Pacific up into the mountains, there was no lack of traces if one only looked for them. Here an unknown people had once lived and established one of the world's strangest civilizations, till suddenly, long ago, they had vanished as though swept away from the earth's surface. 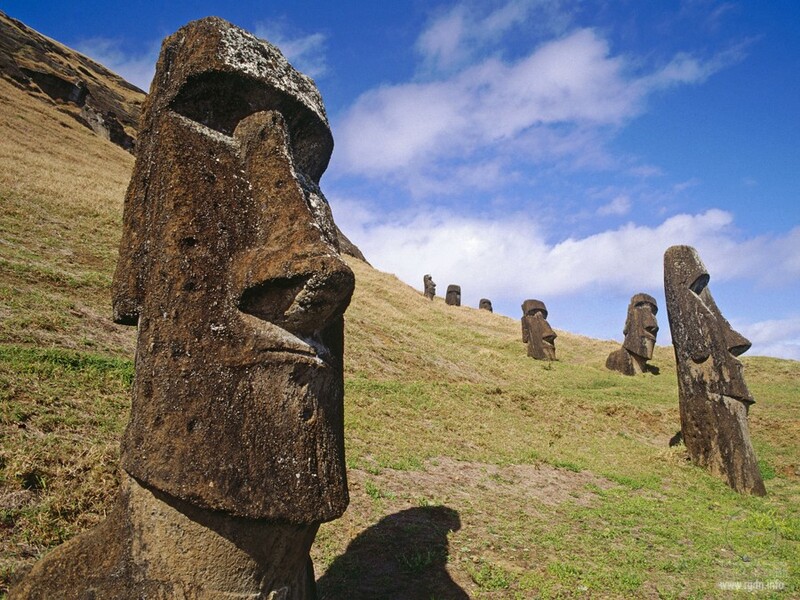 They left behind them enormous stone statues carved in the image of human beings, which recalled those on Pitcairn, the Marquesas, and Easter Island, and huge pyramids built in steps like those on Tahiti and Samoa. They hewed out of the mountains, with stone axes, stone blocks as large as railway cars and heavier than elephants, transported them for miles about the countryside, and set them up on end or placed them on top of one another to form gateways, huge walls, and terraces, exactly as we find them on some of the islands in the Pacific. 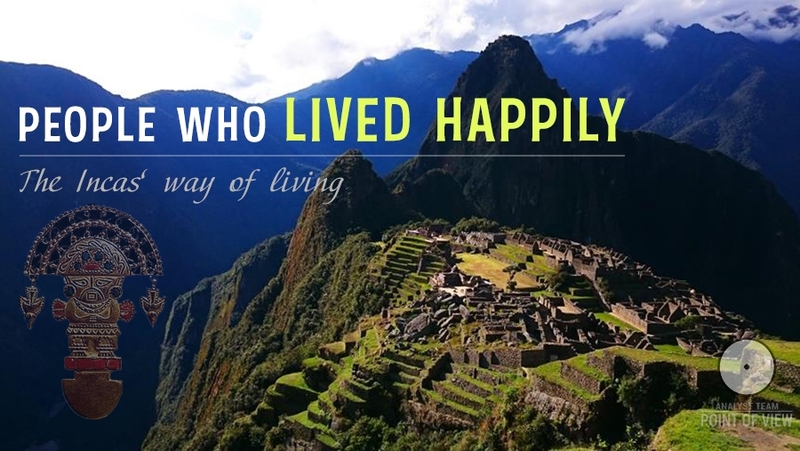 The Inca Indians had their great empire in this mountain country when the first Spaniards came to Peru. They told the Spaniards that the colossal monuments that stood deserted about the landscape were erected by a race of white gods which had lived there before the Incas themselves became rulers. These vanished architects were described as wise, peaceful instructors, who had originally come from the north, long ago in the morning of time, and had taught the Incas' primitive forefathers architecture and agriculture as well as manners and customs. 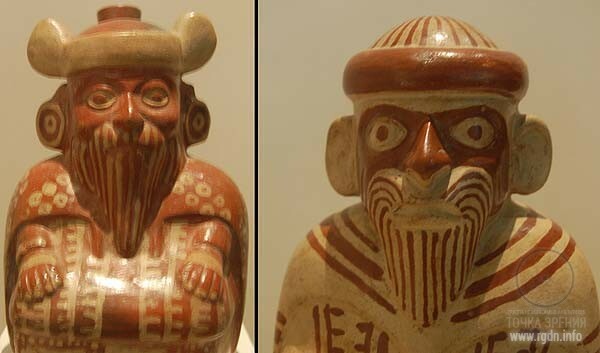 They were unlike other Indians in having white skins and long beards; they were also taller than the Incas. Finally they left Peru as suddenly as they had comma the Incas themselves took over power in the country, and the white teachers vanished forever from the coast of South America and fled westward across the Pacific. Now it happened that, when the Europeans came to the Pacific islands, they were quite astonished to find that many of the natives had almost white skins and were bearded. 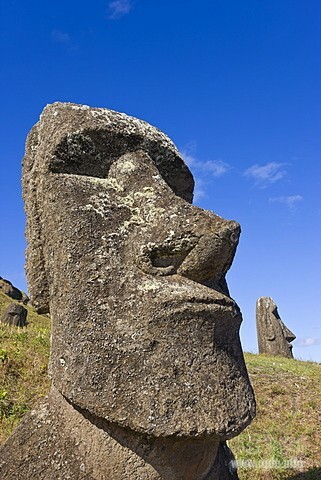 On many of the islands there were whole families conspicuous for their remarkably pale skins, hair varying from reddish to blonde, blue-gray eyes, and almost Semitic, hook-nosed faces. 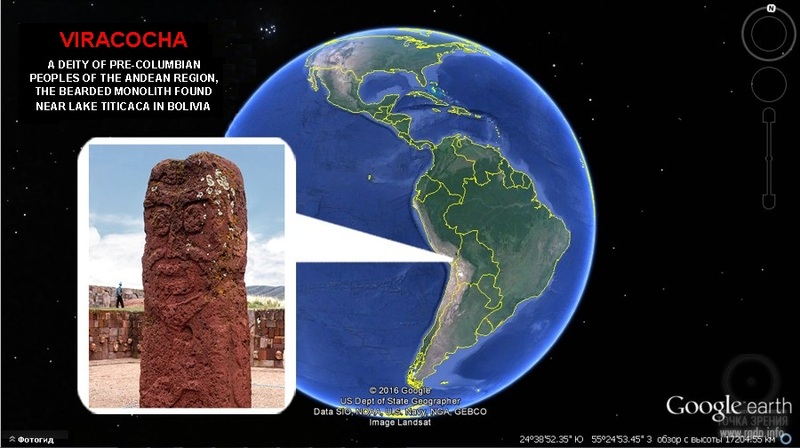 As I pursued my search, I found in Peru surprising traces in culture, mythology, and language which impelled me to go on digging ever deeper and with greater concentration in my attempt to identify the place of origin of the Polynesian tribal god Tiki. I was no longer in doubt that the white chief – god Sun-Tiki, whom the Incas declared that their forefathers had driven out of Peru on to the Pacific, was identical with the white chief-god Tiki, son of the sun, whom the inhabitants of all the eastern Pacific islands hailed as the original founder of their race. And the details of Sun-Tiki's life in Peru, with the ancient names of places round Lake Titicaca, cropped up again in historic legends current among the natives of the Pacific islands. But all over Polynesia I found indications that Kon-Tiki peaceable race had not been able to hold the islands alone for long. Indications that seagoing war canoes, as large as Viking ships and lashed together two and two, had brought Northwest Indians from the New World across the sea to Hawaii and farther south to all the other islands. 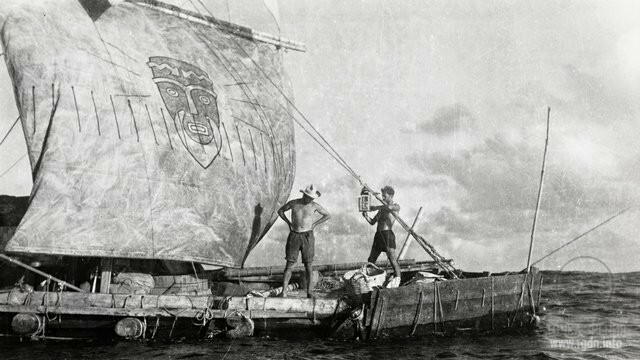 They had mingled their blood with that of Kon-Tiki's race and brought a new civilization to the island kingdom. This was the second Stone Age people that came to Polynesia, without metals, without the potter's art, without wheel or loom or cereal cultivation, about 1100 AD. 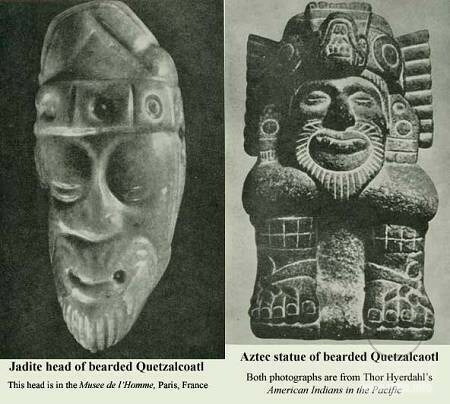 Since historians do not accept the possibility of any significant mutual influence or connection between Pre-Columbian Mexico and the Pre-Columbian Andes, it is assumed to be a coincidence that the ancient cultures of both regions worshipped a pale-skinned, bearded, civilizing god. 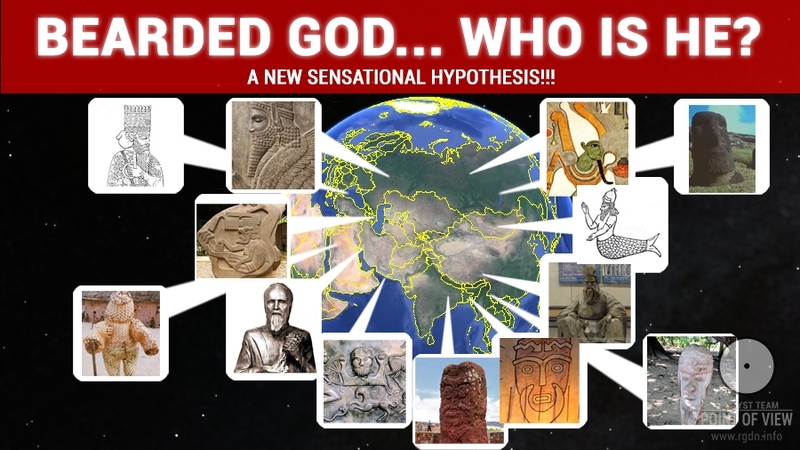 But can it also be a coincidence that both cultures believed themselves to be living in the fifth epoch of the earth and that both specifically characterized this epoch as ‘the Fifth Sun’? 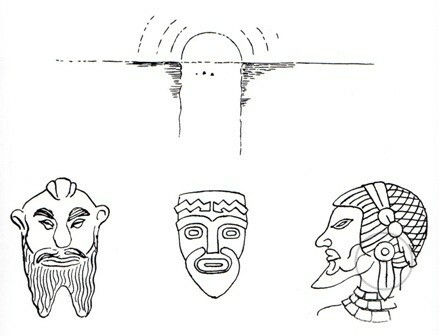 As in Mexico, each of the four earlier Suns was believed in South America to have been destroyed and swept away by a great cataclysm – water, a falling of the sky, air, fire. It was also believed in both places that the Fifth Sun itself was soon to be destroyed by what referred to in Mexico as a ‘great movement of the earth’ and in the Andes as a pachacuti. The word pachacuti means literally an ‘over-turning of the world’ (according to Sir Clements Markham’s translation) and an ‘overturning of space-time’ according to William Sullivan. Our interpretation of what is said in the last paragraph may be found in the articles The Orion-Draco Pendulum and New evidence of the probable global disaster. 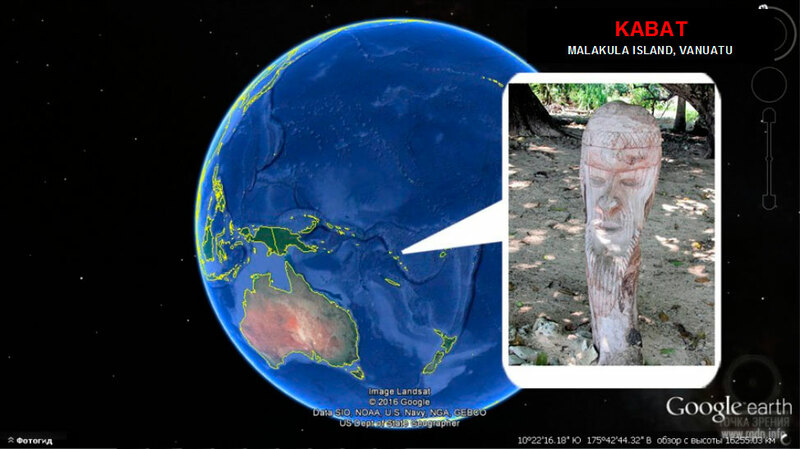 A bearded wooden statue was discovered on Malakula (Malekula) Island in the Republic of Vanuatu. Local inhabitants wear no bears and don’t resemble the character embodied in the statue at all. Local legends say the first dolmen on Malakula was erected in honour of the mythology character named Kabat who hadarrived from faraway seas and brought diverse knowledge to the island. Read more about MalakulaIsland in the articles A new look at an old design, Jim Alison’s lines (Star. The Golden Ratio, Part 5) and Five points of the Star. Agapit of Pechersk (the Unmercenary Physician) (? 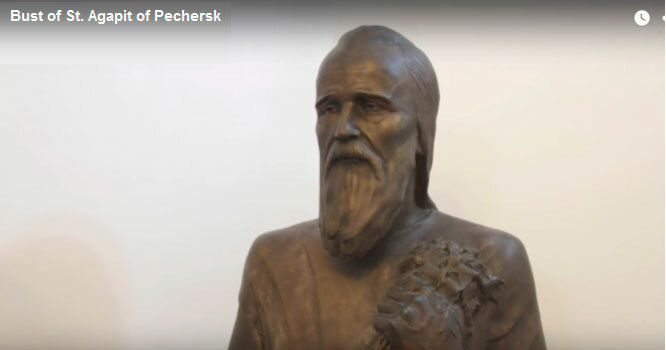 – 1095): Kiev Pechersk monk, physician, saint of the Russian Orthodox Church, worshipped as Reverend. 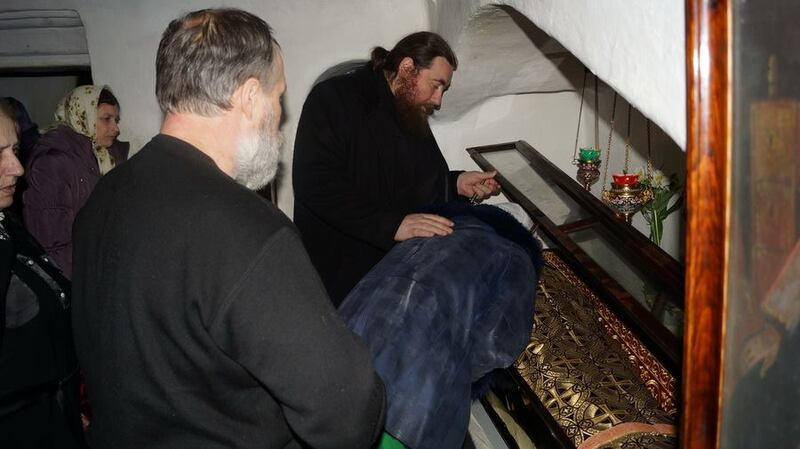 We wrote about him in the article Popularity of Saint Agapit of Pechersk among people. Furthermore, we are preparing a new extensive material with a working title of In quest of Agapit, which will soon be published on our website. 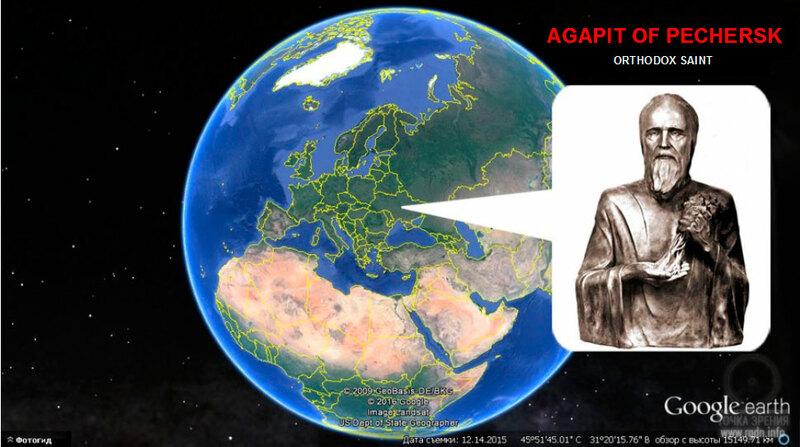 Unknown pages of Saint Agapit’s life are described in Sensei of Shambala (Book II). In the end we’ve decided to include a story of a mysterious teacher who supposedly descended from space to wild tribes of Amazon Indians Kayapo lost in the impenetrable rainforest. That took place a very long time ago, and only legends preserve the memory of him. He is called Bep Kororoti. I learned this story from Julia Matveyeva: she once spoken to the photographer and traveller V. Alekseev who had visited Kayapo Indians himself. He covered this journey in an article on his personal blog http://alekseev-photo.ru/en, and the only thing missing there is a beard. 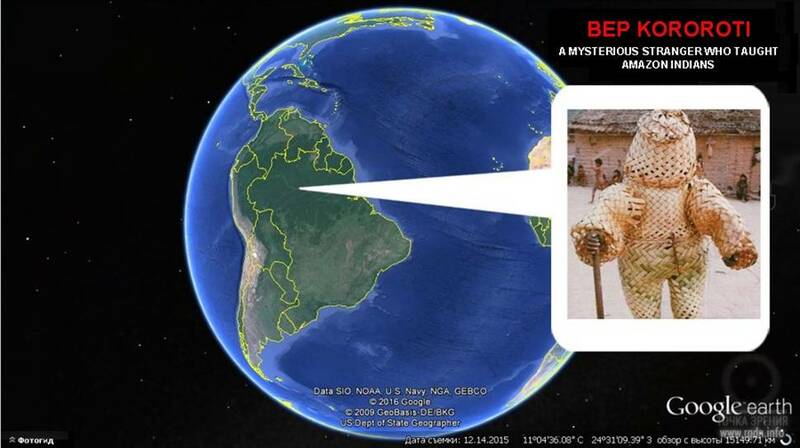 Bep Kororoti is presented in a strange straw suit, but who knows, perhaps, there’s a bearded face under the basket on his head? Bep Kororoti taught people to build houses and to heal themselves, showed them new hunting methods, and people started regarding him as a mighty and powerful god. He even built a special house – a school where he taught children. There are still such schools in Kayapo settlements, where adults teach children all the intricacies of hunting and many other things. Summarizing our informative excursus on mythological ancient times, we can only marvel at grace, patience and industriousness of our great Teachers, Bodhisattvas or deities, gods. Coming to the earth again and again in various bodies and under new names, they continued doing their tough job, awaking sleeping humanity again and again. I don’t know for sure whether it was a single spiritual being or twelve different ones, thus all my statements are purely hypothetical, for I joined them all together in this analytical material via an ordinary male beard. Well, I guess it’s totally possible to assume someone likes to wear a beard while temporarily staying in a human body, isn’t it? 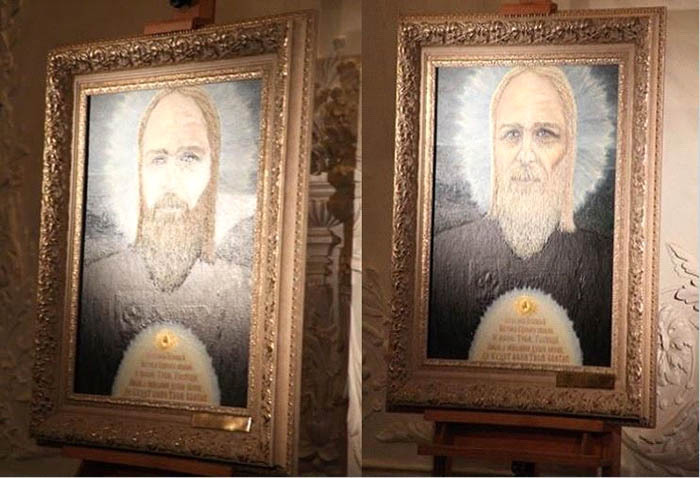 As a matter of fact, even the One who has brought the Primordial Knowledge this time into the world wore a beard until recently (if we judge by His earlier photos). Graham Hancock has suspected a certain connection between “bearded men”, so why would I not follow my intuition as well and assume that one Teacher hides Himself under different names? Notwithstanding the information given in Anastasia Novykh’s books that Rigden Djappo comes to the earth once in 12,000 years. P.S. I might have missed something, so feel free to make additions – it’s never late to amend.